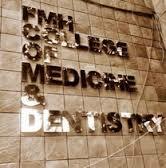 Fatima Memorial Hospital Medicines and Dentistry College is one of the Famous Medical college that is offering the admission in various medical programs Medical Admission in Bach Bachelor of Medicines and bachelors of Surgery MBBS, Bachelors of Dental Surgery BDS, Doctor of Pharmacy Pharm D and Doctor of Physical Therapy DPT and If you are interested to get the admission in the Fatima Memorial Hospital Medicines and Dentistry College FMH Medical College. But for the Medical admission in the Bachelor of Medicines and bachelors of Surgery MBBS, Bachelors of Dental Surgery BDS, Doctor of Pharmacy Pharm D and Doctor of Physical Therapy DPT APTITUDE TEST/ INTERVIEW are must. The candidates who fulfill the minimum academic requirement for admission are short listed through aptitude test/interview. You can get the Online Preparations for the Medical admission Test MCAT because below we provided the online subject wise Test for the preparations. The entry test comprises Biology, Chemistry, Physics and English for applicants. We are providing the online test and Interview preparations for the Entrance test MCAT and Medical test to get the admission in any Medical University of Pakistan. So you must try these all test for the preparations because we are sure that these test will be very helpful for your admission test in Medical University.